Toilet paper is made from woodchips. With 1.4 billion people, China is the Worlds largest market for toilet paper. The Tasmania-Asia woodchip conveyor belt works 24-7, shipping woodchips to pulp mills, mostly in China and Taiwan. Often the woodchips are shipped in huge bulk carriers once used to transport coal. The Asians don't care where the woodchips come from and the perpetually cash-strapped Tasmanian government are only too willing to grow the Asian population explosion by supplying them with everything they want. Why Tasmania is permanently broke is another story, born out of Tasmania's awful European history as a dumping ground for British convicts and the genocide orchestrated by an elitist colonial regime. The same kind of people that wiped-out the Tasmanian Aborigines and opposed ending convict transportation are still in government today. They are a corrupt, inward-looking gang of ideologues that only exist in regional outposts like Tasmania. Both native forest and plantation eucalypts are used for woodchips. The plantation woodchips are FSC 'controlled wood' and 'chain of custody' and are all certified from one desk at Global-Mark North Ryde in Sydney. The main eucalypt plantation players are Forico and Smartfibre. Forico are a front-end for British pension funds based in the Channel Islands. Forico bought Gunns 'genetically improved' e.nitens and e.globulus plantations. Smartfibre are a front-end for 'Reliance Forest Fibre' operating from a taxhaven in the Cayman Islands. Obviously the Tasmanian government are highly impressed by tax avoidance? Smartfibre/Reliance are part of US Global Forest Partners. They 'leased' 29,000 hectares of Forestry Tasmania's pulpwood plantations on public land for 99 years. What an idiotic deal? Imagine what will be happening on this 'public' land a century from now? Established at a cost of $3,348 per hectare, the Forestry Tasmania plantations are probably the worlds most expensive tree plantations. They were sold for just $2,093 per hectare and the public was informed on Facebook about the write-down of their asset. Tasmanians went without medical treatment and adequate schooling to establish these ridiculously over-priced plantations. Where in the civilised world would the health minister put out a media release about the sale of trees? The Greens Party always supported tree plantations because they think plantations protect native forests. (The Greens have only just realised that ecological destruction is caused by global overpopulation). As a result tree plantations have had no political opposition in Tasmania. For 2 decades there has been an effective propaganda campaign run by tree plantation companies to essentially cover-up the fact they are not growing normal trees. The 2 eucalypt species used in Tasmania, nitens and bluegums have been intensively developed over a 30 year period. Tree breeding in Tasmania became a local obsession peaking in the late 80's and early 90's and resembling the 'Tulip Mania Bubble'. An island of half a million people had 3 or 4 university departments devoted to tree modification. They wrote endless papers, had conferences, tours and had a distorted idea of the importance of 'engineered trees'. The genetic tree breeders became an academic 'cult' insulating themselves from outside input. Inside Tasmania believes it is now very difficult for Global-Mark, Forico and Global Forest Partners to prove the nitens breeding programs do not contain genetically engineered material. The researcher above, Gillian Rasmussen spent at least a decade working with Dr Wayne Tibbits. They worked together at APPM in 1991 and at North Eucalypt Technologies and North Forest Products up until 2000. The same Dr W.N.Tibbits now does FSC auditing for Global-Mark on the very trees he helped develop. Conflict of interest or something more sinister? The probable vector of genetically modified material entering North Forest Products nitens breeding program was from 'overseas infusions'. Here genetic material was merged into the 'rolling front' clonal breeding program. The trees are created from cells, not seeds. The 'genetic material' (above) from Fletcher Challenge may have been transgenic. "Since 1995, Fletcher Challenge Forests worked with Genesis Research and Development Corporation, New Zealand’s biggest biotechnology company, on research into genetic modification of trees". In 1999 Fletcher Challenge Forests, Genesis, Monsanto, International Paper and Westvaco announced a US$60 million joint venture. The joint venture company, called ArborGen, produces genetically modified tree seedlings. In 2001 Rubicon was spun-off Fletcher Challenge Forests. ArborGen was bought-out by NZ company Rubicon last year. Rubicon NZ or Rubicon Victoria? There are Fletcher Challenge Forestry transgenic patents going back to 1997. The patents from Fletcher Challenge, Genesis, Rubicon and Arborgen involve the agrobacterium-mediated genetic modification of trees including eucalypts. Back in 1986 Dr Tibbits wrote his thesis on 'Frost Resistance in Eucalyptus Nitens'. Unfortunately, selective breeding can only produce trees where frost resistance is the best result of natural selection over millions of years. It cannot produce the huge economic gains demanded by forestry companies. Why is frost resistance no longer an issue in 2018 and how was it solved? In 1990 Dr Tibbits won a Churchill Scholarship around the world trip visiting many forestry biotech companies. The above grab from Dr Tibbits Churchill report indicates he saw advantages in engineering sterile eucalyptus trees. Does Dr Tibbits still support genetically engineered trees? Does he support induced sterility in trees? If so why is he implementing the FSC 'no genetically modified trees' policy? Does Dr Tibbits know why there are no photos of flowering plantation nitens in Tasmania? Does Dr Tibbits know why the tree plantations he audits do not produce seed and why plantation owners are forced to return to the clonal nursery to get their next rotation? 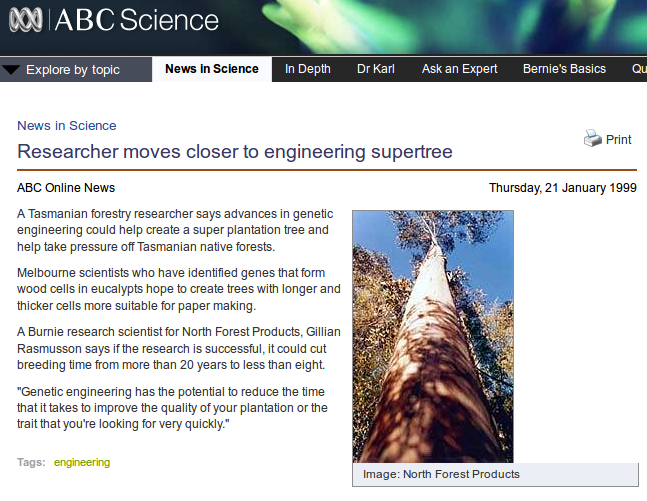 Did Dr Tibbits notice Gillian Rasmussen was 'engineering supertrees' in the lab they shared at Ridgley Northern Tasmania? Does Dr Tibbits know why increased cell size for pulp wood is no longer a research priority when it was once so important? Does Dr Tibbits know why reduced lignin content is no longer a research priority when it was once so important? 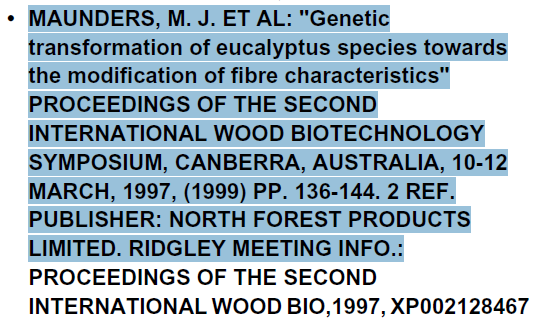 Does Dr Tibbits know why the 1997 Shell patent "Genetic transformation of eucalyptus species towards the modification of fibre characteristics" refers specifically to North Forest Products and Ridgley where he worked? 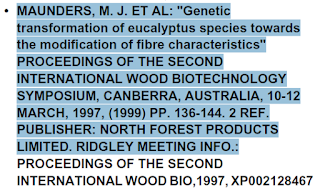 Does Dr Tibbits know why there were 'confidential reports' on the 'Fletcher Challenge Paper Eucalyptus nitens breeding population' provided to Forestry Tasmania? Inside Tasmania hopes Dr Wayne Tibbits can answer these questions. In our view the secrecy and mistrust surrounding the unnatural e.nitens plantations in Tasmania has put the forestry companies, Global-Mark and FSC Australia into disrepute. Global-Mark quote "Global-Mark will not: – Offer certification when relationships that threaten impartiality cannot be eliminated or minimised. – Certify a client when the company relationship with a management systems consultancy poses an unacceptable threat to impartiality." Reliance Forest Fibre (RFF) bought most of Forestry Tasmania's plantations in 2017 after RFF had existing for only a few weeks. In 2018 RFF bought Smartfibre and registered it with ASIC on March 16 2018 providing a serviced office in Fyshwick ACT as an address. It appears Smartfibre kept trading as part of Neville Smith Forest Products until the EOFY. Smartfibre's FSC certification was automatically transferred to RFF by Global-Mark. Before the general public knew RFF had bought Smartfibre, RFF decided to upgrade their FSC certification. On July 5 2018 Dr Tibbits composed a document for the Global-Mark website. 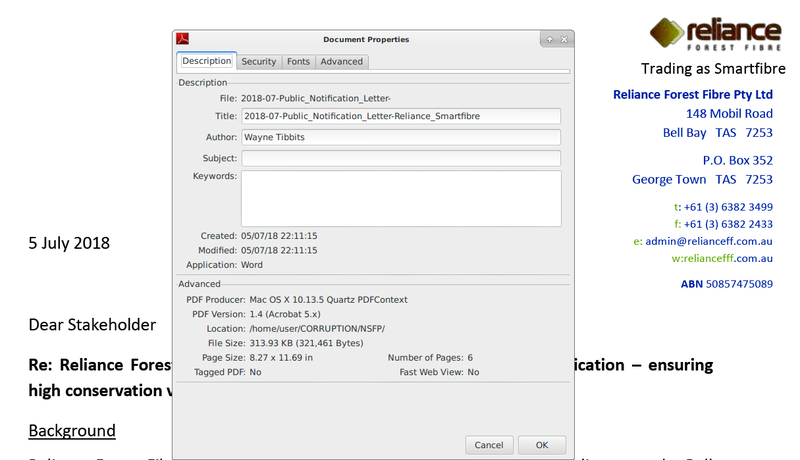 The document properties show Dr Tibbits composed the 'public notification letter' from Reliance. According to an analysis, Dr Tibbits also wrote the letter from Reliance Forest Fibre purporting to have been written by chip mill manager Danny Peet. 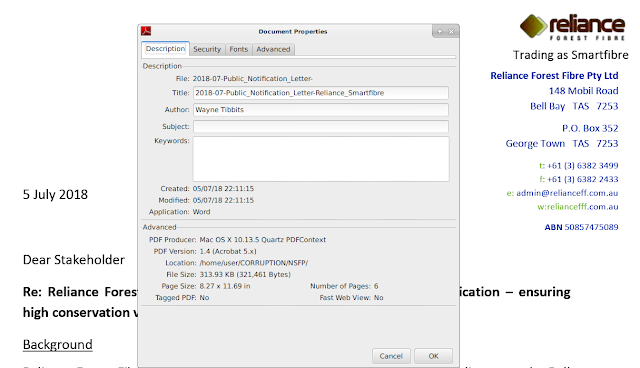 The RFF 'stakeholder' letter and the Global-Mark cover letter were authored on the same day, in one document. Our research found Danny Peet didn't write this letter at all. There are signs like fonts and computer system used that make this the work of one person. Notice how RFF claims to have a website in their letterhead? It doesn't exist. So why did RFF communicate to their 'stakeholders' through their FSC auditor? Here we see certification being fast-tracked through the controlled wood system by an 'auditor' with an extraordinary interest in the product he helped develop. It appears Dr Tibbits works primarily for the companies he is certifying rather than the certification company, FSC or the national interest. Then we see their application dealt with instantly and allegedly written by their FSC auditor. We also know the Tasmanian government failed to inform the public a foreign company based in a tax haven had bought Smartfibre. They knew by June 2018 Smartfibre's forest practices officer was now working for Reliance Forest Fibre. Is this the work of a crime cartel or a functioning FSC system? It could be an attempt by Rob De Fegely to get FSC certification for STT/Forestry Tasmania because Reliance Forest Fibre can disappear just as quickly as it was created. Remember, that FSC Australia warehouses certificates so they can be transferred to Forestry Tasmania when RFF is strategically folded. No wonder people have lost faith in the FSC system? FSC has consistently put foreign interests ahead of the Tasmanian public. The FSC 'stakeholder input' pantomime is a callous 'tar baby' strategy of exhausting the time and energy of concerned residents in a cynical, corrupt system. Why are people forced to provide information anonymously outside of the corrupt FSC system? It's because the retribution and intimidation of the logging industry still exists. It's time FSC was either purged of corrupt industry operatives or closed-down completely. This is appalling and needs to be investigated. I am a founding director of FSC Australia and am on the verge of having nothing more to do with FSC and become a vocal critic. FSC has become a farce the way the certifying bodies go about their business. In 15 years our community nor I have ever been contacted or seen an advertisement calling for comment of nay certificate in Victoria. I live near an American plantation companies pines and was involved in their initial move for certification and raised proven issues. All that happened was Hancocks refuted my proof, I was never called or contacted by the certifying body for comment and have never been contacted since. FSC is fatally flawed with the system of companies seeking certification paying the certifying bodies. This is destroying the credibility of FSC as it appears they need to get certificates up to maintain their businesses and cash flows. This case in Tassie looks like the same flawed problem.